"Get Out," an installation by Mary Jo McGonagle of Southport will be on display in the Silvermine Arts Center's new exhibits opening on Sunday, Feb. 24. Silvermine Arts Center will open a new set of exhibits, ranging from the abstractions of Sharon Cavagnolo to the visually complex installation by Mary Jo McGonagle, the hyper-real figurative paintings of Anca Pedvisocar and the aptly named "Human Touch" print group show on Sunday, Feb. 24. The show runs through April 5. An opening reception takes place from 2 to 4 p.m. on Sunday, Feb. 24. In her exhibit, "New Paradigms," Cavagnolo deals with chaos and the human need to control and come to terms with it. "If I've seen it before," said Cavagnolo, "it holds no interest. The sole purpose in painting for me is get to these new paradigms. I have always thought that a painter with a different way of seeing things can never be understood without the opportunity to show an ample body of work. As with friendships, we develop a familiarity and relationship with work as our experiences deepen. We develop a rapport, open ourselves to it, accept a bit, and as it becomes a part of our interior life, we find ourselves coming back and wanting more." Her installations have included work for the White House and the governor's mansion in Virginia, and have been showcased in magazines. Cavagnolo has exhibited at the Carriage Barn Arts Center and the Katonah Museum of Art. A recipient of the Journeyman Award from the Isabel O'Neil Studio in New York, she now devotes herself to painting full time. She has been a member of the Silvermine Guild of Artists since 2010. "(Dis)connect" is the new site-specific installation by McGonagle, a Silvermine Guild Artist. 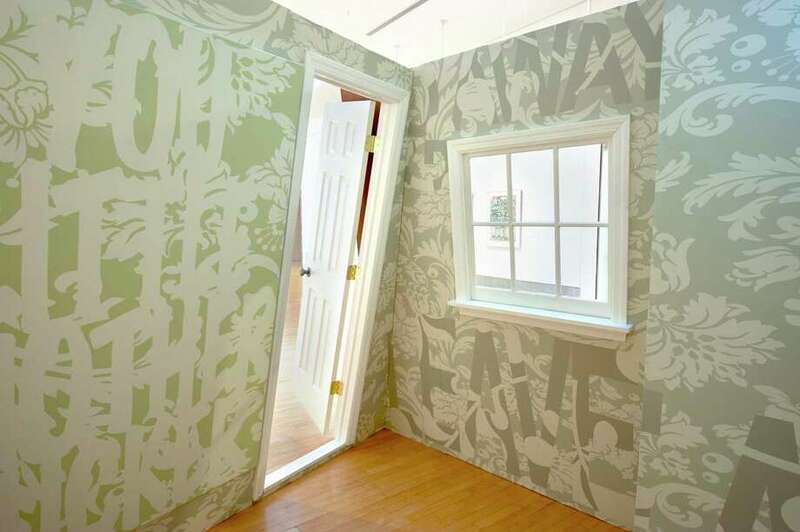 Combining video and signature wall coverings and paintings, the installation reflects her fascination with how relationships take place in everyday lives, hovering between humor and desperation. "I strive to make people aware of the complexities that take place within one's `private' space and bring these issues forward to the `public' space," she said. She has shown throughout the country and extensively in the Northeast. She was recently recognized in the April/May 2011 issue of New American Painter and nominated for the 2012 Joan Mitchell Foundation Grant. A resident of Southport, she became a member of the Silvermine Guild of Artists in 2011. Aca Pedvisocar's exhibit "Take 2" is about second chances given to forgotten moments in forgotten lives of forgotten people, to be re-lived in a different way by people of our time. The central theme of Pedvisocar's paintings is a mixture of tension and solitude that seems to bring people together, while simultaneously pulling them apart. Pedvisocar was born in Bucharest, Romania where she studied mural painting. She left Romania in 1984, emigrating first to Israel and then Paris before coming to the United States. She restarted her career as a mural designer, then as a textile designer and finally returned to easel painting. She has participated in numerous group exhibitions in New York City and Connecticut and last year had a solo show at the RIVAA Gallery in New York City. She has been a member of the Silvermine Guild of Artists since 2010. The guild group exhibition, "The Human Touch: Five Printmakers," showcases new figurative works by five members who share a love of printmaking, exploring contemporary interpretations of the figure in a variety of print techniques, including woodcut, intaglio, lithography and other media. For information on these exhibits and other events at the Silvermine Arts Center, 1073 Silvermine Road, visit www.silvermineart.org or call 203-966-9700, ext. 20.